Mysuru: Two persons from city were among three killed in an accident that occurred near Maddur on Mysuru-Bengaluru Highway at around 1 am today. Three more persons were injured and they have been admitted to Mandya Institute of Medical Sciences (MIMS). The victims are 28-year-old Shakeel Ahmed, a resident of Udayagiri, 29-year-old Farooq, a resident of Udayagiri and 25-year-old Sagar, a resident of Hanakere in Mandya Taluk. According to the Police, Shakeel Ahmed, Farooq and three of his friends were travelling from Mysuru to Bengaluru in their Skoda car (KA-01-ME-8717). They left the city around midnight and were heading towards a Gym in Bengaluru. They were reportedly fitness freaks and wanted to spend their Sunday at a Gym in the State capital. 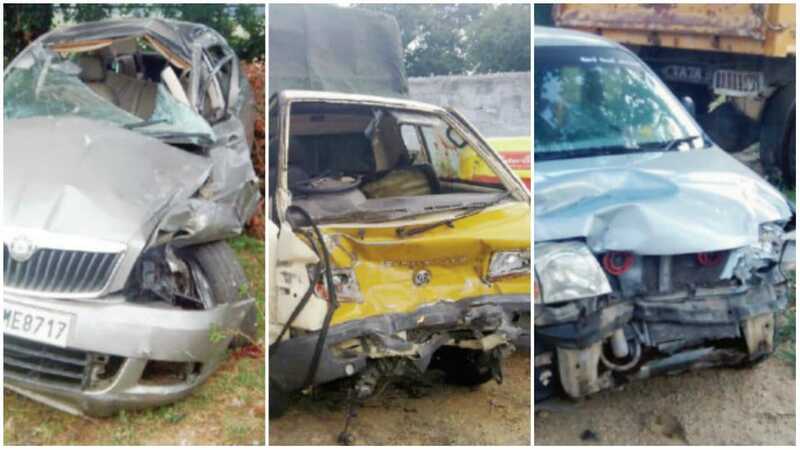 Police said that the person who was behind the wheels was overspeeding and as the car neared Kolli Circle near Maddur, he lost control over the vehicle and hit the road divider on the Mysuru-Bengaluru Highway. The car climbed the divider and hit a mini tempo that was coming from opposite side. The speeding car next hit a Santro car that was following the mini tempo. Sagar, who was driving the mini tempo died on the spot. The front portion of the tempo had caved in, crushing Sagar. The impact of the accident was such that the Skoda car skidded off the road after hitting the mini tempo and the Santro. The left side of the car was ripped apart due to the impact. Details on who was driving the car, where the victims were seated and the names of the injured were not available. Police said that Sagar was a jaggery trader and was returning to Hanakere after supplying jaggery to a place in Ramanagaram.